If you feel the need for a little break from all the holiday shopping and festivities, I recommend a walk in the woods. If the ground isn’t snow-covered, you might look for Partridgeberry (Mitchella repens) while you are out walking. 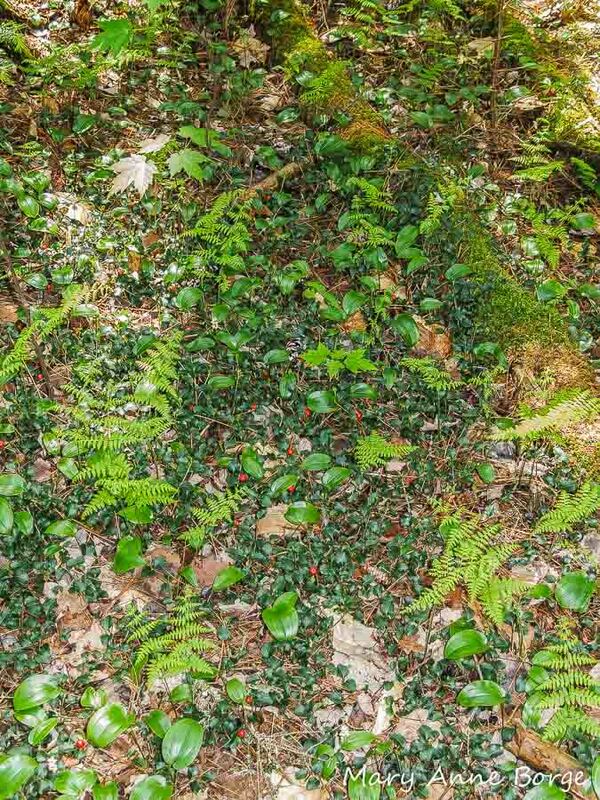 It’s a low evergreen perennial that creeps across the forest floor, resembling strings of tiny holiday garlands. 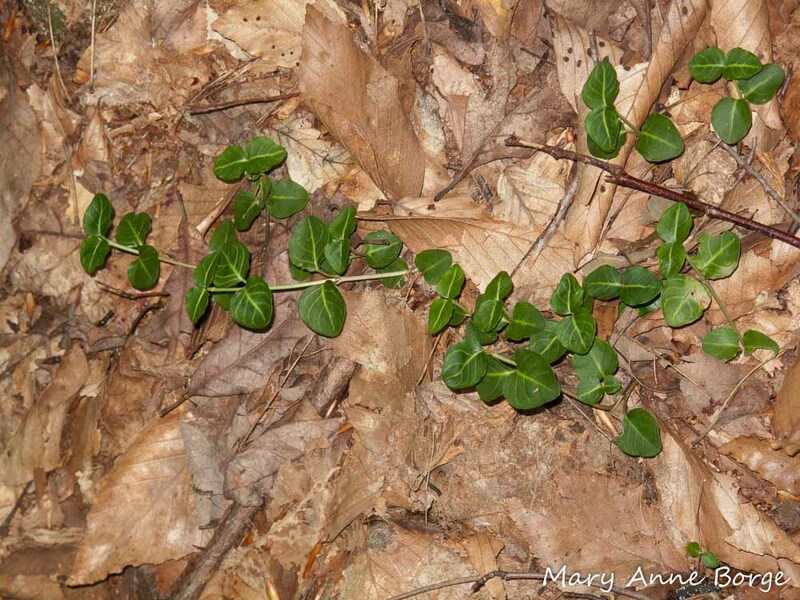 Partridgeberry may be peeking out from under fallen leaves. 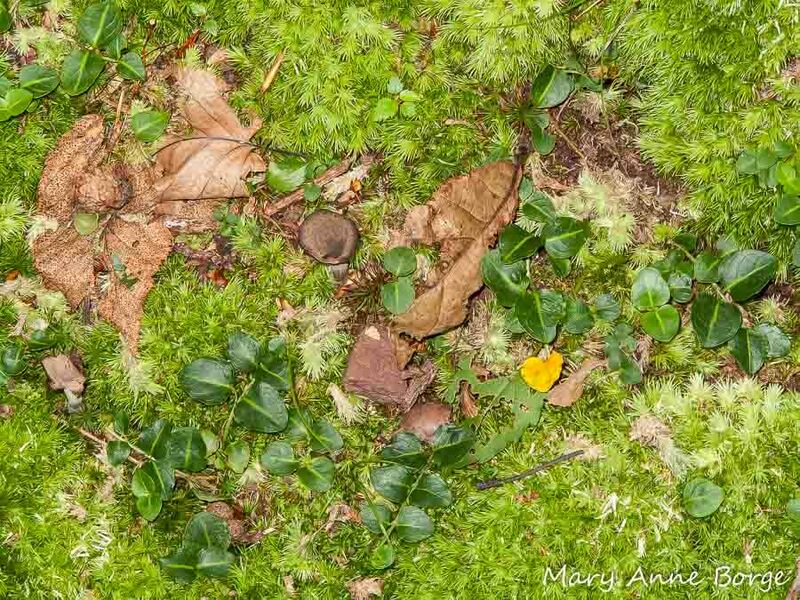 Look closely at a patch of moss, and you might find Partridgeberry interspersed with it. Partridgeberry’s bright red fruit usually persists on the plant throughout the winter and even into spring. Partridgeberry (Mitchella repens) in spring, with fruit from the previous year still present. It may actually be easier to find Partridgeberry in the winter than it is during the growing season, depending on its situation. 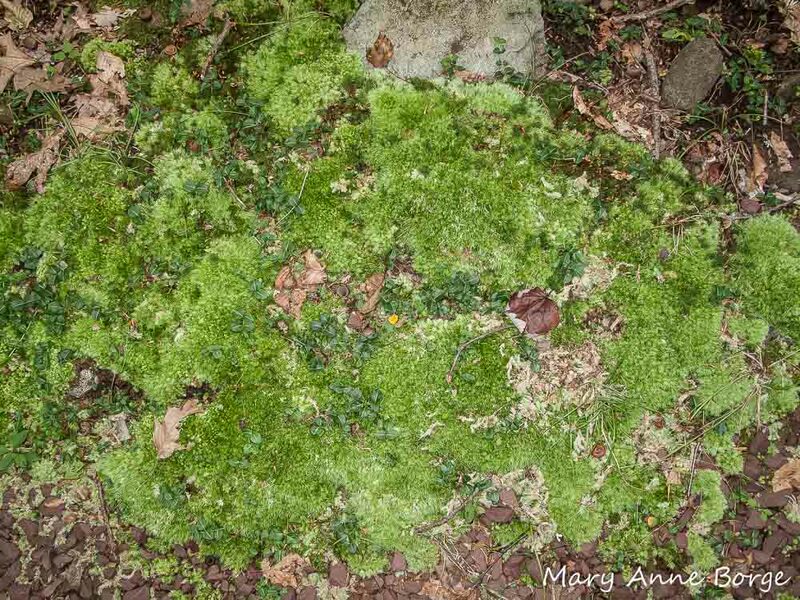 This diminutive ground cover may be hidden by taller herbaceous plants and shrubs in the late spring when it begins to bloom. If you find it in winter, you’ll know where to look to see the flowers, probably sometime in late May or June. Bumble Bees are the primary pollinators of Partridgeberry’s tiny trumpet-shaped flowers. The flowers are always in pairs; in fact, they are actually joined. 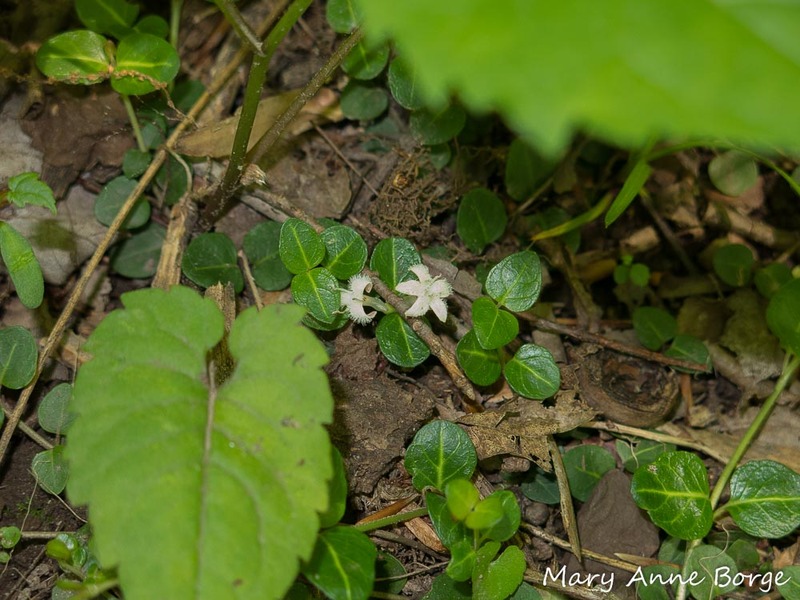 Partridgeberry’s (Mitchella repens) paired flowers in bloom. The two flowers share a single ovary, the part of the flower from which a fruit develops. As a result, no more than one berry is produced for every pair of flowers. You might think of this as analogous to conjoined twins that share a body part. 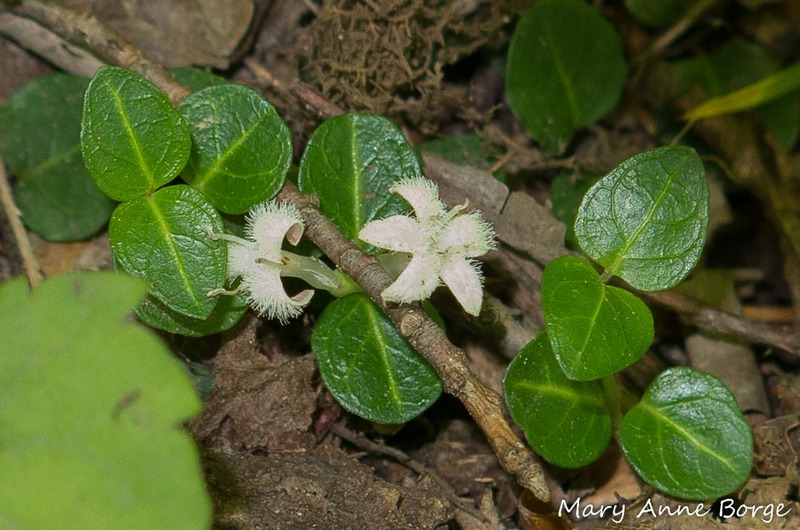 In recognition of this trait, another common name for this plant is Twinberry. If you look closely at the fruit in the photo below, you can see two dimples, each with a somewhat jagged edge. This is where each individual flower was joined to the ovary. Partridgeberry (Mitchella repens) fruit. Notice the jagged edged ‘dimples’ where the two flowers were attached to their shared ovary. Wild Turkey, Ruffed Grouse, Bobwhite, White-footed Mice, Red Fox and Eastern Chipmunks are among the animals that eat Partridgeberry fruits. The animals subsequently disperse Partridgeberry’s seeds, which are accompanied by natural fertilizer (the animal’s excrement) to give the seeds a good start. Native American tribes have used various parts of Partridgeberry, sometimes in combination with other plants, as a gynecological aid and pain reliever, as well as to treat rashes and urinary tract problems, among other problems. 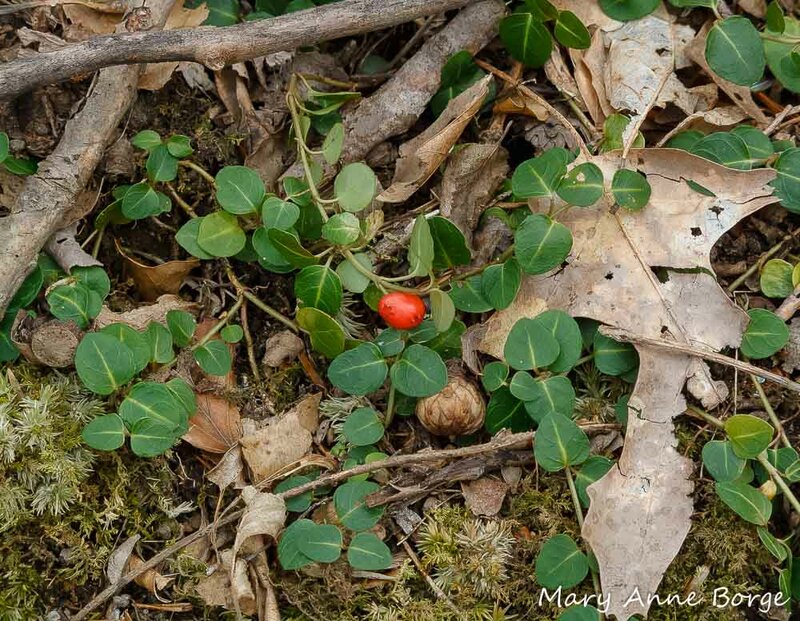 Partridgeberry can be found in the woods of the eastern half of the United States, and in the Canadian provinces of Ontario, Quebec, New Brunswick, Nova Scotia, and parts of Newfoundland & Labrador. For the holidays, do whatever best renews your spirit. A walk in the woods will do it for me. If the ground is snow-covered, there will be other holiday decorations to see, courtesy of nature. Nothing you have to put up, or take down. No muss, no fuss. Just beauty. 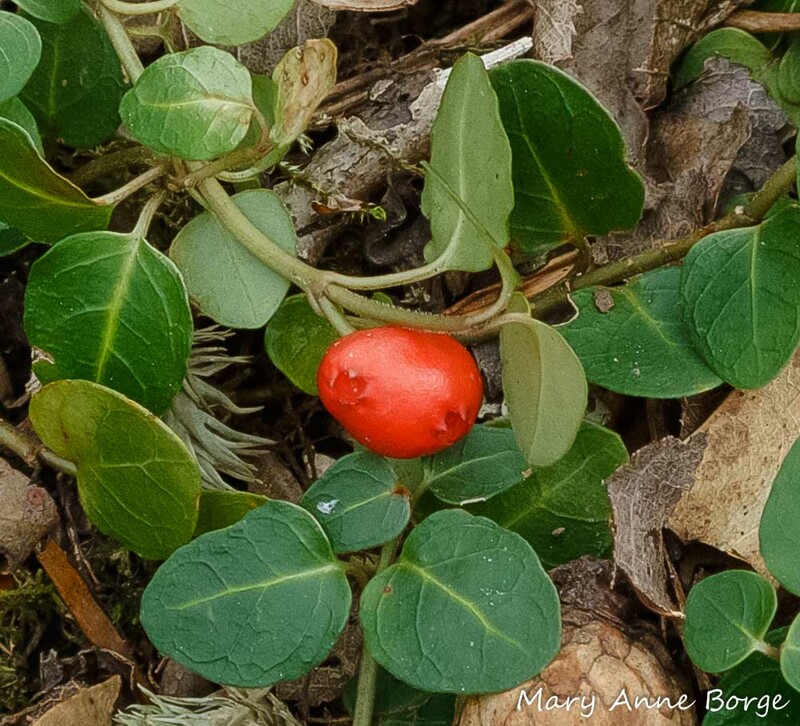 This entry was posted in Medicinal Plants, Native Plants, Nature and tagged Mitchella repens, nature, Nature in Winter, Patridgeberry, Twinberry by Mary Anne Borge. Bookmark the permalink. I very much enjoy your blog, with such beautiful pictures and well-observed commentary. Do you ever publish in print? Thank you! Some of my photos have been published, and I have written several articles for Butterfly Gardener magazine and a local paper. I’ll have to branch out! Merry Christmas to you, Patricia! Reading this post provided a peaceful interlude to the hustle and bustle of the season. Almost as good as the walk in the woods that you recommend! Thank you, Mary Anne. Thanks, Julie! Enjoy the holidays. See you soon!